This month I wanted to feature LarisaAna. 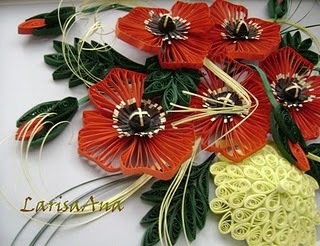 I met her on Facebook and her quilling is just phenomenal! She has amazing talent that she is gracious enough to share with us. Thank you LarisaAna! Here is just an example of some of her work. You can see it all on her blog. Go have a visit! WOW her Art is so Beautiful, thanks for sharing, will check her sight out! I LOVE it! Those flowers are amazing. 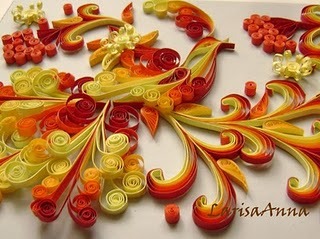 I have done simple quilling before and was shown by some that quills BUT I have never seen work like that. AMAZING!! OMGosh, I can't wait to go over and visit her blog!!! Wow! This work is amazing. Monica, I have something for you on my blog. Each work is pure art of LarisaAna. I am a grenade admirer of your work! This is what you call an art. So beautiful, very creative and unique. 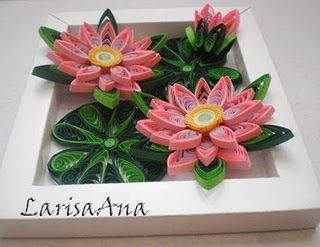 You're so gifted Larisa Ana. More power to your artwork.